As you all know, this month’s feature cookbook by The Cookbook Guru is: The Complete Margaret Fulton Cookbook. My last post from this cookbook featured the old favourites Burnt Butter Biscuits. In that post, I mentioned I thought the sweet section of the book had stood the test of time better than the savoury. Not to be a defeatist, I made the Spiced Beef on page 153 of the 1974 edition. It tasted pretty good but it was supposed to be eaten as a cold meat and Maus and I had it hot with vegies. And, even though I used the ingredients as listed, I didn’t follow the instruction too closely, All in all, not post worthy. * All up, you will need about 300g of walnuts. We made 40 biscuits using a 20 mil tablespoon of batter for each biscuit. Preheat the oven to 180°C. Line baking trays with baking paper. Using an electric mixer, cream the butter with the icing sugar until light and fluffy. Sift the flour with the bicarbonate of soda, baking powder and salt. Fold the flour into the creamed mixture. Form the mixture into balls, place on the prepared baking trays, flatten slightly with your fingers and then top each with a walnut half. Bake for 10–12 minutes or until lightly browned. Transfer to wire racks to cool. 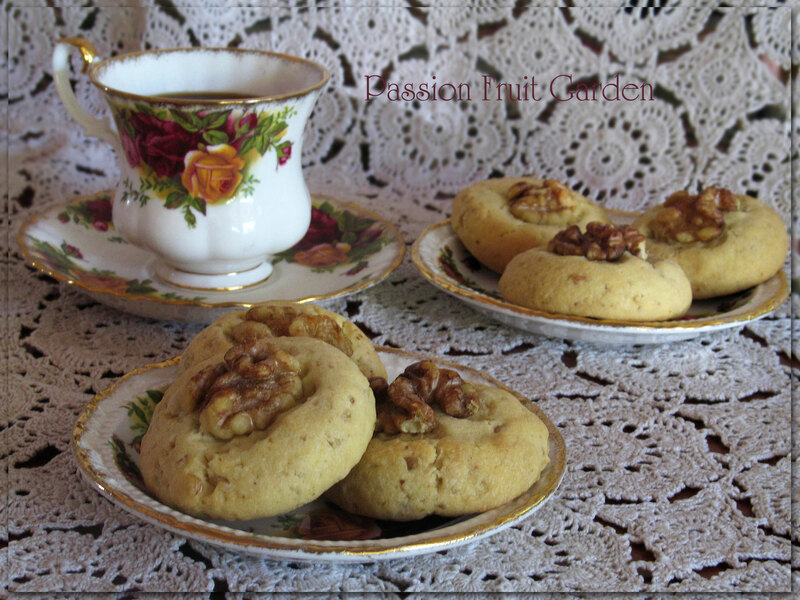 This entry was posted in Biscuits & Slices, Sweet Things and tagged Margaret Fulton, Old fashion biscuits, The Cookbook Guru by Glenda. Bookmark the permalink. I always enjoy reading your blog, Glenda, and this one made me laugh. I feel a bit sorry for Maus, though. Now those look very tasty. I always forget that you call them biscuits and we call them cookies. Our biscuits would be more like the size of a bread roll. Doesn’t matter what we call them though does it – it’s all good. Hi Diane. They still taste as good whether they are cookies or biscuits. Perhaps this is a good recipe for that big bag of black walnuts I have. Hi Connie, That sounds perfect. I love bikkies like these! The recipe reminds me a bit of Hungarian kifli..
Celia, I had to look up what Hungarian Kiffles were. Yum, I think walnuts give biscuits (anything really) a wonderful flavour. I added a leftover handful to this weeks smoko biscuits for the G.O. and they were lovely. I ask the G.O. does he want cake, banana bread or biscuits. He always chooses biscuits so he can dunk them in his tea. Like you, sometimes I choose otherwise regardless. Ella, I just love walnuts. They make everything yummy. These little biscuits sound delicious, Glenda. Walnut it always good in sweets. I’m pretty sure as the weather cools down for us down under that is should be compulsory to have a sweet treat with your cup of tea or coffee. For me I’d look no further than these delicious sounding Walnut Butter Biscuits that Glenda has contributed from this month’s book from Margaret Fulton. Hiya Leah. Loved your rock cakes.